An epilepsy surgery program was set up not in a research university hospital, but in a “normal” clinic. A Digital-EEG Monitoring system for preoperative diagnostics integrated in a normal hospital environment was implemented. The Mara clinic was chosen. Mara clinic in Bethel takes care for about 8000 epileptics living in the neighborhood. In 1988 team from von Bodelschwinghsche Anstalt Bethel (vBA) came to The Cleveland Clinics Foundation (CCF), Ohio USA to learn about the know-how of epilepsy surgery. Dr. H. Meenke and Dr. H. Holthausen were there for diagnostic, surgeon Dr. H. Panneck for operation and Dr. T.A. Vuong for physiological computing. We stayed with our family one year in CCF to study about the epilepsy surgery, from medicine to techniques of digital EEG in Epilepsy monitoring. I came back 1989 to Germany and became general manager to design clinical digital EEG-monitoring and build up a “24-7 production” system for Mara clinic. Preoperative EEG monitoring for epilepsy surgery requires a continuous recording of EEG in about one week (24-7) per patient. Some seizures occured unpredictably and one seizure lasted a few minutes. Only EEG-seizures-sequences were used for diagnostics and the rest of recording were thrown away. If one uses conventional EEG machines recording directly on paper, then one has to spend immense cost for the amount of EEG recording paper, of which only a small part is needed. Using invasive subdural-gird-electrode, the system expands to 1024 – 2560 recording channels for 4 -10 beds with 256 channels / bed. The cost of EEG-Amplifier for each channel is very high (1000 -2000 U$ / channel, price at this time), but the number of recording channels per patient varied from 32 to 256 channels, so a sharing solution must be found to reduce the amplifier-cost. EEGs and Videos must be recorded and synchronized to play back for the analysis. Patient actions were monitored by nurses and documented for diagnostic information. EEG-Monitoring system is integrated in hospital business as usual; therefore that system is not only a technical complex of electronics devices, computers, network and software, it must meet requirements of medicine diagnostic, patient help-care and regulations for employer. EEG Monitoring System in Bethel is a multi-user paperless digital EEG-recording machine integrated in Mara clinic. Its components are installed in intensive bed-rooms, in a nurse central station and doctors rooms for diagnostics. The complex spreads in two floors of the hospital-building. The monitoring system is based on client-server architecture. It could record 256 EEG signal channels (option: to 512 channels) and is operating in 24-7. Patients share EEG-channel by a multiplex computer controlled switching system of modular amplifier modules (32 channels / module) which are customized by Dr. T.A. Vuong from standard EEG machine. Analog EEG-signals are digitized and stored in a server as EEG-data streams with patient ID, electrode names and timestamp. EEG-data could be accessed and converted to graphic signals back for on-line monitoring or off-line reading. EEG-data-stream could be set tags with timestamp from nurses according to patient observation, e.g. : seizure, sleeping, eye movement. According to recorded timestamp and marked tags, recording EEG-Data and Video sequences could be reviewed synchronized with many information about the vitals of patient that are useful for diagnostics. Budget was limited and a plan was determined on the mile stone (first epilepsy surgery operation was planned). There was not a test or a preproduction system and the budget was only for a production system. Modular computer controlled amplifier modules were in development, in the time software are implemented. The cabling of network and connection electronic systems was installed parallel with writing software for control devices. Even the clinic bed-rooms were renovated and installed with other medical instruments. The system was tested in construction time step by step. The construction team consisted of different groups: external contractors, internal and external engineers, data bank specialist, programmer and interface developer. It takes a lot time for discussion by buildup process. Design- or develop- tools are not available as of today. The completed system architecture, connections blue plan of hardware (electronics) and software structure were drawn and written by me per hand on paper with color pens! For user friendly of observation-station, I draw per hand the station and made a carton 1:1 model to demonstrate to doctors and nurses! After 2 years of construction, “the baby” was born in 1991 and developed to a production system which has been in existence for 25 years. 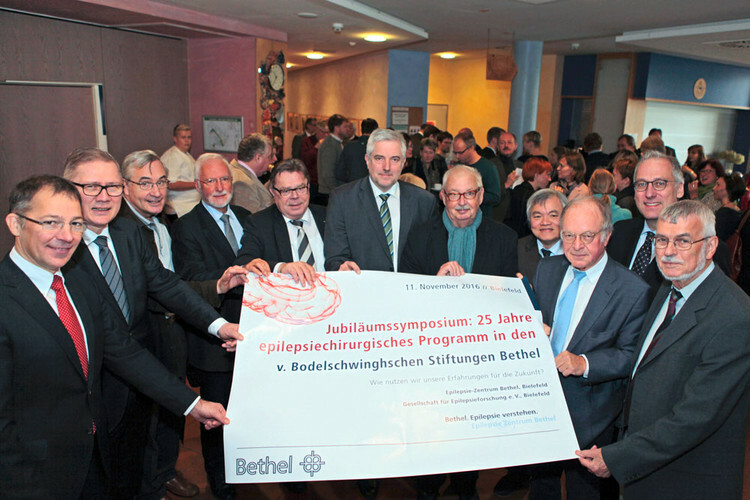 With the celebration of 25 years Epilepsy Center Bethel Germany, it is very fortunate to hear that 1100 patients are seizure free after operations. Congratulation Epilepsy Center Bethel for its 25th anniversary! © 2016, Dr.-Ing.The Anh Vuong, Bielefeld, Germany . This entry was posted in Agile Management, Bioinformatics, Digital Transformation, Digital Transition, Project Management. Bookmark the permalink.